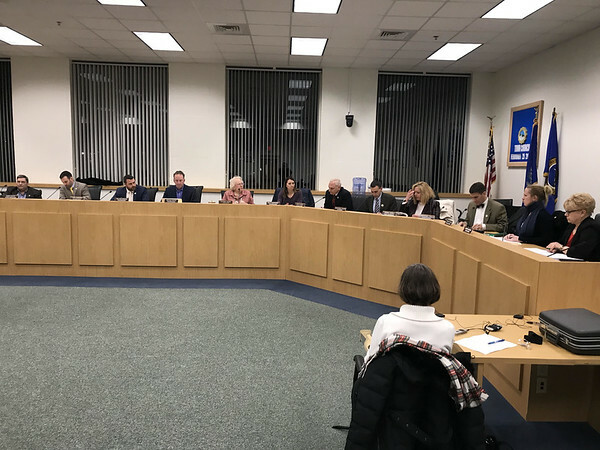 SOUTHINGTON - The Town Council set a public hearing for April 22 on the proposed 2019-20 budget as approved by the Board of Finance Monday and will vote on it during its first May meeting. The public hearing will be held at 7 p.m. in the Municipal Center at 200 N. Main St. The proposed budget totals $153.83 million, which includes $98.98 million for the Board of Education budget and $54.85 million for the General Government budget. If approved, the tax rate would increase from 30.48 to 30.87, a 0.39 mill increase. This budget is a product of workshops which revised the budgets originally proposed by Town Manager Mark Sciota and the Board of Education. Under Sciota’s original proposal, the town budget would have been $55.07 million, which was a $1.83 million increase from last year’s General Government budget of $53.23 million. The budget approved by the Board of Finance is instead a $1.62 million increase over last year’s General Government Budget. Under the Board of Education’s original proposal, the board would have spent $100.22 million - a $4.39 million increase over the previous year’s budget of $95.83 million. The budget approved by the Board of Finance is instead an increase of $3.15 million over this year’s Board of Education Budget. Additionally, the Council also voted Monday to approve the creation of the Town Policy Diversity Committee and the Heritage Identity Study Committee. The Diversity Committee is chaired by Town Manager Mark Sciota and includes Michelle Passamano, human resource manager for Southington Public Schools, Police Chief Jack Daly, Elizabeth Chubet from Southington Public Library, Jacqueline Santos-Villegas, junior accountant from the town’s finance staff, Jason Marques from the Police Department dispatch, David Lapreay from the town’s recreation department, Christina Simms from Youth Services and the Board of Education’s Southington Public Schools Coalition for Social Justice, Reverend Ronald Brown from First Congregational Church, resident Dorie Conlon Perugini and O.J. Shaw from the Bristol NAACP. Sciota said that the Heritage Identity Study Committee was created to review historic sites in town. “When Councilor Dawn Miceli brought up this idea last month, she mentioned that there were some homes in Southington that were part of the Underground Railroad,” he said. Posted in New Britain Herald, Southington Herald on Tuesday, 9 April 2019 19:32. Updated: Tuesday, 9 April 2019 19:35.